Studies show that sitting could be as detrimental to your health as smoking, increasing your long-term health risks and potentially shaving years off your life. This lack of movement causes our bodies to stop providing the energy and blood flow needed to regenerate cells and build muscle, and can lead to increased risk for long-term health issues including high blood pressure, high cholesterol, diabetes and even heart disease. Fortunately, sitting for eight hours a day, like smoking, is a decision all our own and we can change our behavior to prevent its effects. 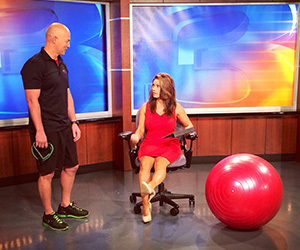 Cal Fit Fitness Director, Jason Mathes spoke with KCRA’s Lisa Gonzales about the importance of incorporating exercises into your work day.